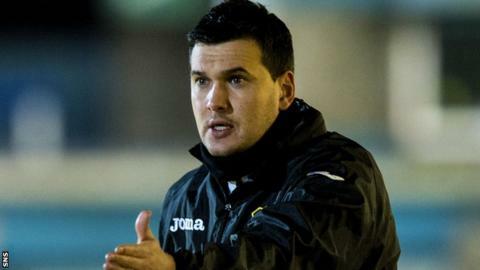 Dumbarton manager Ian Murray is hopeful of signing a new deal with the Scottish Championship club. The 33-year-old's current contract runs out at the end of the season and the Sons still have a chance of reaching the promotion play-offs. "We're hopefully getting something sorted out," Murray told BBC Radio Scotland's Sportsound programme. "We've both done well for each other. They've given me a chance to manage a team in a really good division." And he added: "I've hopefully repaid them with keeping them in the league, probably looking at a top-half finish and obviously a Scottish Cup quarter-final." Queen of the South currently occupy the final play-off berth going into the final two rounds of fixtures and hold a three-point advantage over Murray's side. The former Hibernian player admits qualification would present some challenges to Dumbarton but is still eager to stay in the promotion hunt. "I'm looking at it from a part-time point of view," explained Murray, who took on the manager's post in 2012. "If we get in the play-offs we need to use an extra month's wages, we have to keep our part-time players ticking over. We have to find games from somewhere to keep everybody going. "And then, if you get to the end of it, you've got to play a full-time Premiership team, who are going to be fitter than you. That's just a fact. "But that's the way it is. For us to get in there would still be fantastic."